The early morning Kattan Kaapi is one of the most followed rituals in a Keralite family. So it is for most of the keralites settled outside Kerala too. And for this one cup, they would buy an entire year's ration in one go during their annual visit to Kerala. The kattan kaapi evokes feelings of nostalgia and an invisible bond towards their hometown and the place they belonged to once upon a time! This one concoction in the morning satiates and helps them to keep going for an entire day. 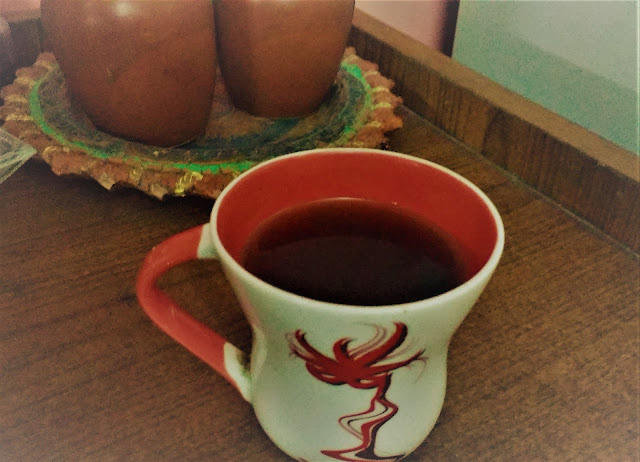 The rest of the day can then be dedicated to the lesser preferred tea in any form... plain tea, tulsi tea, ginger tea, green tea, etc. The special taste and aroma of the kattan kaapi can only be achieved with the special South Indian coffee powder that is available in South Indian stores outside kerala. Though the preparation of this simple beverage is equally simple, many don't get it right. It is the proportion of the sugar and coffee powder that matters. This cuppa is supposed to be high on sugar and coffee powder both.. but the preparation is slightly tricky. The coffee powder should not be so strong that it starts turning sour in the mouth or so light that it becomes tasteless and watery. So, it has to be prepared carefully. Some people prefer the coffee powder straight – the coffee beans roasted and powdered just as it is, but there are others who prefer the coffee powder with a little chicory added to it. Both tastes equally good. A very simple method of preparation - in one cup boiling water, add one heaped teaspoon of sugar and then one not so heaped teaspoon of coffee powder. It usually takes me atleast two three preparations per coffee powder that I buy new, to get to the right proportion to follow for the rest of the days.. so, essentially it is about practice!! !